On the hunt for that perfect used car? 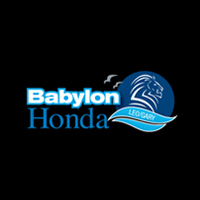 When you choose a pre-owned vehicle from Babylon Honda, you can trust that whatever make and model you choose has been thoroughly inspected for quality. Better yet, we have a variety of used car specials available on popular used models like the Honda CR-V so you can feel good about what you choose to drive home to Lindenhurst. After you’ve taken a look at our pre-owned vehicle specials online, be sure to contact us to make an appointment and visit us in person! We look forward to getting you behind the wheel of a pre-owned car you’re excited about for a price you’ll love. Want to make your vehicle even friendlier on your wallet? Consider trading in your vehicle. 2015 Honda CR-V EX-L Certified. Priced below KBB Fair Purchase Price! Clean CARFAX. CARFAX One-Owner. 26/33 City/Highway MPG AWD. Awards: * 2015 KBB.com Brand Image Awards 2016 Kelley Blue Book Brand Image Awards are based on the Brand Watch(tm) study from Kelley Blue Book Market Intelligence. Award calculated among non-luxury shoppers. For more information, visit www.kbb.com. Kelley Blue Book is a registered trademark of Kelley Blue Book Co., Inc. Honda CERTIFIED---- BAD CREDIT--CHALLENGED CREDIT--NO CREDIT-- NO PROBLEM-- Honda Certified Pre-Owned Details: * Limited Warranty: 12 Month/12,000 Mile (whichever comes first) after new car warranty expires or from certified purchase date * Roadside Assistance with Honda Care purchase * Transferable Warranty * Vehicle History * Powertrain Limited Warranty: 84 Month/100,000 Mile (whichever comes first) from original in-service date * 182 Point Inspection * Warranty Deductible: $0 Advertised offer to those who finance through the dealership. Banks like to see a $1995 down payment for preferred financing. Internet pricing is reflective of $1995. All prices exclude dealer prep, sales tax, title and tags. 2015 Honda CR-V EX-L Certified. Priced below KBB Fair Purchase Price! Clean CARFAX. CARFAX One-Owner. 26/33 City/Highway MPG Odometer is 7761 miles below market average! AWD. Awards: * 2015 KBB.com Brand Image Awards 2016 Kelley Blue Book Brand Image Awards are based on the Brand Watch(tm) study from Kelley Blue Book Market Intelligence. Award calculated among non-luxury shoppers. For more information, visit www.kbb.com. Kelley Blue Book is a registered trademark of Kelley Blue Book Co., Inc. Honda CERTIFIED---- BAD CREDIT--CHALLENGED CREDIT--NO CREDIT-- NO PROBLEM-- Honda Certified Pre-Owned Details: * Transferable Warranty * Vehicle History * 182 Point Inspection * Roadside Assistance with Honda Care purchase * Powertrain Limited Warranty: 84 Month/100,000 Mile (whichever comes first) from original in-service date * Limited Warranty: 12 Month/12,000 Mile (whichever comes first) after new car warranty expires or from certified purchase date * Warranty Deductible: $0 Advertised offer to those who finance through the dealership. Banks like to see a $1995 down payment for preferred financing. Internet pricing is reflective of $1995. All prices exclude dealer prep, sales tax, title and tags. 2016 Honda Odyssey SE Certified. Clean CARFAX. CARFAX One-Owner. 19/28 City/Highway MPG Odometer is 4292 miles below market average! Awards: * 2016 IIHS Top Safety Pick * 2016 KBB.com Best Buy Awards Winner Minivan * 2016 KBB.com 16 Best Family Cars Minivan * 2016 KBB.com Brand Image Awards 2016 Kelley Blue Book Brand Image Awards are based on the Brand Watch(tm) study from Kelley Blue Book Market Intelligence. Award calculated among non-luxury shoppers. For more information, visit www.kbb.com. Kelley Blue Book is a registered trademark of Kelley Blue Book Co., Inc. Honda CERTIFIED---- BAD CREDIT--CHALLENGED CREDIT--NO CREDIT-- NO PROBLEM-- Honda Certified Pre-Owned Details: * Transferable Warranty * Limited Warranty: 12 Month/12,000 Mile (whichever comes first) after new car warranty expires or from certified purchase date * 182 Point Inspection * Warranty Deductible: $0 * Vehicle History * Powertrain Limited Warranty: 84 Month/100,000 Mile (whichever comes first) from original in-service date * Roadside Assistance with Honda Care purchase Advertised offer to those who finance through the dealership. Banks like to see a $1995 down payment for preferred financing. Internet pricing is reflective of $1995. All prices exclude dealer prep, sales tax, title and tags. 2014 Jeep Grand Cherokee Summit Priced below KBB Fair Purchase Price! Clean CARFAX. CARFAX One-Owner. Odometer is 35237 miles below market average! 4WD. Awards: * 2014 IIHS Top Safety Pick HONDA CERTIFIED---- BAD CREDIT--CHALLENGED CREDIT--NO CREDIT-- NO PROBLEM-- Advertised offer to those who finance through the dealership. Banks like to see a $1995 down payment for preferred financing. Internet pricing is reflective of $1995. All prices exclude dealer prep, sales tax, title and tags. Advertised offer to those who finance through the dealership. Banks, like to see a $1995 down payment for preferred financing. Internet pricing is reflective of $1995 down. All prices exclude dealer prep, sales tax, title and tags. All prices plus tax, title and license with approved credit. Picture may not represent actual vehicle. Price varies based on trim levels, options and accessories. See dealer for in-stock inventory and actual selling price. The displayed Pre-Owned vehicles are limited quantities, unique, and often one of a kind based on the specific vehicle’s options, colors and mileage. These vehicles are offered on a first come, first served basis, and subject to prior sales. Dealer is not responsible for any misprints.